He has provided seed for the sower. Obediently trusting, praying using all the faith that you have, you have come to a time of favor with the Lord and He calls for your strength! That is where you are - so now you have to go ahead and begin with what you have. Its’ time to begin, steady your thoughts to focus on Him, your feet are planted in a secure foundation in Him, you have made the decision and you can’t begin with what you don’t have, so you begin with what you do have. The Lord has seasons of beginnings and endings. And usually when He ends something – He begins another thing. All the while He has the best for each of us in mind when He plans our Way. 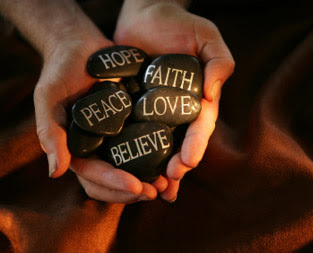 Speak with faith the Miracle filled Words that Jesus spoke. Speak Exactly His words, by Faith-Believing them--Speak Them out loud to the Father. Make sure they are His Words and not thoughts about His Words, or about Him- but Speak Exactly His Words out loud Trusting by Faith, Believing that the Father will accept them and do what you have asked of Him in the name of His Son. There is a huge difference between speaking about Who Jesus Is and What all that He offers, and speaking His Words just as He did in faith, believing He Will do what we ask of Him. Many think they are speaking His Words and then are sadden and full of frustration when they realize that His power is not in them working for them. As badly as the world needs to see Him too many of His followers are merely spreading, saturating the world with thoughts and words About Him and not allowing themselves to shine His light. His Power is to work through us, not us simply telling about His Power, but to see it in action through us. Then there are other followers who are not able to Show His Peace because they are not living it, but they are talking about His peace. We have to Believe in His Peace, His Joy, His Power and Believe that all of those seeds live within your heart, rippling outward for all to be touched by it, to see Him living in each of us. To see His Peace alive in His followers, who should be calm, not flustered and full of worry and trouble because of the outward situations and circumstances. Lead by Faith not feeding fear. No matter What the situation is and the circumstances are around us, we are to Be His Joy, spreading it not just talking about it. It comes from the depths of security and believing by faith trusting that His True Power and Peace abide In us and comes through us to Show Him to others. To show others that His Peace and Joy Keep us calm, steady, secure and ready to begin with what we have. Living it-Shows it and Sows it. Start with what you have and begin. The Lord has spoken His Truth in your heart, have you written it all down? It is your outline that you will build upon. 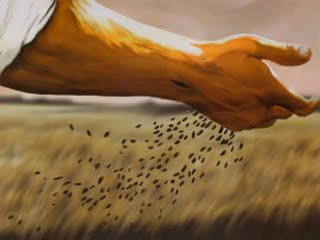 He has provided Seed for the Sower. He has stretched out His hand for you, Start with what you have and begin by Faith, and with each step keep Trusting as He moves you through the transitions and challenges that come with Believing whole heartedly what you have prayed for-the same thing He has put in your heart. He said that we must become as little children to enter the Kingdom of Heaven to have the faith of a child in Him. Following His example of simple obedience doing-living His commandments will allow us to find what we seek. He said, "I came not to do Mine own Will but the Will of Him who sent Me." To begin with what you have and not to worry or be hindered by thoughts of what you do not have, following His lead along the Way of simple obedience, sowing the seed that He has provided to the Sower.